Proud to say my son worked on THAT banner! Glad SWOP let him work on that. Did a little working out yesterday. That felt good to be able to do that. Going to keep it up. I don't know if I'll get to the gym today, but I will by tomorrow for sure! My birthday was nice. Had some nice text messages, email messages and phone messages. I'm hoping to get some good reading for the long weekend. Lakoff and Hartman most likely. Here's a good interview with Lakoff. What he doesn't mention is Obama beginning to use the "tax relief" frame for spreading the wealth. It might make his job a little harder. Just like the "Support the Troops - Bring them Home" signs. Also a nice article by a friend of the blog. Machi's article in the NM Independent. Oh, and it's kind of cool to have your daughter quoting you... Look at the SWOP Blogger. Dia de Los Muertos interview! By the way, I had an awesome birthday!!! I'm walking around more. The pain is still there, but receding slowly. If I get a chance today I'll set up a workout routine. The Raza Unida meeting last night went great! The rehearsals this week were OK.
Got a gig tomorrow night at Blue Jeans! ¡Feliz Dia de La Revolución! Please visit the new blog - Nuestra Familia. It seems like there actually is an opportunity to change America. I think that's amazing. It seems like the Bush years really wore people down. Now we get to move forward. Thought for the day: Generosity makes you feel good - and people feel good when they are smiled at. So try smiling at people today spread your wealth! Busy week! Should be good. So much to blog about! I'll just have to try and catch us up later. Here's something on "Healthy Democracy" - there's no analyses on the two-party system, but there is stuff in there about Universal Registration. At least they support part of what the rest of the world's democracies have. Paul Pino and the Tone Daddies! Listen to great NM Music - Rock, Blues and Chicano all in one band!!! Then again on Saturday, December 20!!! The bar is going to see if we can get a turnout - so please come drink responsibly and be merry! Every person helps!!! And you can celebrate the Accordion Players birthday on 11/22! He'll be 21!!! The Educational Assistants sicked out yesterday. I called the AFT office and asked if there was a way for the community to support the EAs. I left a message and haven't heard back. I think going to the website and emailing them would be good. The Union is saying that they didn't have anything to do with the walk out. And the new Superintendent is already using the "these people" language. Youth are the most important asset for any community. Educational Assitants are a part of developing that precious asset by supporting their education. If they are not being paid a basic living wage then we show a lack of value and concern for our children. How much we invest in the empowerment of our children through their education says a lot. We invest a large percentage of the NM State budget into education, but obviously we either need more, or need to see where we can invest in educators before administrators. 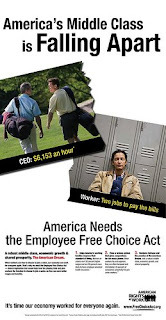 Support the Educational Assistants, support Unions and support the Employee Free Choice Act! Today seems like it is going to be a great day! I finished a good chunk of work yesterday and I can start focusing at a better pace today. On the personal front, walking is getting better and I'm starting to walk with less pain. I'm lifting a little bit and worked out with my daughter on Sunday. More to come. Oh, and I will likely start a new blog soon. Veteran's day is supposed to be about celebrating people who fought wars to ensure our freedoms. I think if you have the day off, we should realize that we all need to ensure our freedoms... if you're off - go do some work for equality for QGLBT folks! Everyone has the right to love who they want and how they want! Caring is the core of Raza Unida. That caring places a responsibility to act – to care for ourselves and for each other. Part of that responsibility is to develop the strength to act on that caring. Because we care we have a responsibility to do something and that requires us to build the capacity to take action! We have the responsibility to express our values of caring. We have the responsibility to act on those values. And we have the responsibility to build the strength to be caring. That strength will come from us moving beyond our issues into a broader sense of humanity. This will mean bringing those things we are most passionate about together. Strength will mean putting our values and our people in charge of our world. We've recently seen the potential of putting issues second to unity and power. Now is always a good time to make government and our society play its most important roles – protection and empowerment. Protection from abuse and oppressions, empowerment to attain our full human dignity. Join La Raza Unida and help us work together for the caring, safe and healthy world we all want to enjoy and leave for future generations! As for "What do we do now?" Here's an answer that sounds promising - GO BIG!!! People have asked me about why I have been so excited since I didn't vote for the "winner" this election. Mainly because I care about people. I think that government should take the common wealth and use it for the common good. I think that we need to create lots of organizations to make that happen. When the "founding fathers" started out they weren't sure about the usefulness of political parties. Apparently though on today's spectrum of left to right - Hamilton would be ultra-left and Ben Franklin (the most conservative) would be Center. The Dems go from Kucinich to the new President. So now seems a great time to make politics about caring again! Thanks for the comment Aurea! I'm really happy to have been able to stand for who closest represented me over the wave. That means I really appreciate all the people who got people out. I did some, what I could do as a volunteer. It will be easy now for the "critiques." People will be critizing those who didn't do MORE to get the vote out for Obama, people will criticize those who did, people will critizice Obama himself! There will be a clamor to "get on board" or "get with the program." I think there is only one program - it is time to make America a place where people care about people again! For me that means we have to clarify internally with La Raza Unida that we exist because we care about people. We need to care for ourselves and others and acting on the responsibility that comes with that caring. It also means that we have to become strong enough to act on that responsibility. We have to hold government to their key roles - protection and empowerment. Protection comes as regulation of business practicies, pollution, and ill health among other problems. Empowerment will come as giving all of us fair access to the common wealth. Business gets more return on roads, the internet, and other infrastructure - they should pay their fair share so the rest of us have access to quality schools, health care, and real political participation. I'll keep clarifying that for myself and for others. Keep the comments coming and KEEP LEFTING!!! I noticed last night the boos from the audience in McCain's camp and the good sentiment from the Obama rally. It pointed out to me that the Republicans have sowed so much bad sentiment that they finally imploded. Even Smacking pointed that out. What bugged was that there were 3 visits from Obama get out the vote peolpe during the day. One time I came out right after and my Nader sign was on the ground. (We had both an Obama and a Nader sign.) We went to the SWOP and the Democratic celebrations and when we returned someone had taken the Nader sign all together. Since there were no Republicans walking my neighborhood I have to assume that not all of Obama's followers are as open as he. I voted for Cynthia McKinney - I just couldn't find anyone with signs. Not that I didn't want Obama to win, but I felt pretty comfortable that my vote wasn't going to swing the election. So now the real work begins. Time to write letters, make plans, and organize, organize, organize! My first steps are to get rid of this cold, then write letters to McKinney and Nader and get them to work on election reform, and then write Obama and the NM delegation to raise minimum wages! More information on what didn't make last nights' reporting on ballot access news!